Japanese language files. Core and Calendar, Filemgmt, Forum, Links, Polls and Staticpages plugins for Geeklog 1.4.1. Korean language files and Calendar, Links, Polls and Staticpages plugins for Geeklog 1.4.1. Czech language file (czech.php) for Plug-in Links (1.0.1) for Geeklog (1.4.1). Czech charset is ISO-8859-2. 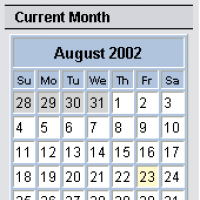 Czech (ISO 8859-2) translation for Calendar Plugin 1.0 (Geeklog 1.4.1). This hack allows for quick lookup of IP addresses detected by the wonderful Bad Behavior plugin. The ARIN, APNIC, LACNIC and RIPE whois lookup URLs are encoded into the display for each log item line along with a convenient lookup of the entire IPV4 address space. Just correct Russian translate for Calendar 1.0.0 (GeekLog 1.4.1) plugin. The archive includes supplemented and fixed Russian translations for Geeklog 1.4.1 core script. Enjoy! Please note that this is not the final version yet and may contain bugs. If in doubt, download the latest stable release (currently 1.4.0sr5-1) instead. The archive includes both Chinese Simplified and Traditional UTF-8 translations for Geeklog 1.4.1 core script. Enjoy! Japanese language files and Calendar, Filemgmt, Forum, Links, Polls and Staticpages plugins for Geeklog 1.4.1. Japanese language files for Geeklog 1.4.0 and 1.4.1 and for Calendar, Filemgmt, Forum, Links, Polls and Staticpages plugins. Please note that this is not the final version yet and may contain bugs. You're invited to try it out but to actually run a productive Geeklog site, you may be better off with the latest stable release, 1.4.0sr5-1. russian translation for spam-x plugin. russian translation, i was short in time, so next version will be more correct. With just 30-35 lines of code changed in the heart of geeklog, you can support readonly and writeonly story topics without any database structure changes. The zip file contains instruction for making changes to a 1.4.0 system that will enable this functionality. Changes are made to 5 existing core files. Not for the inexperienced or faint of heart hack installer as the changes involve lib-security.php and alter core security functions. Garden is now available for download!